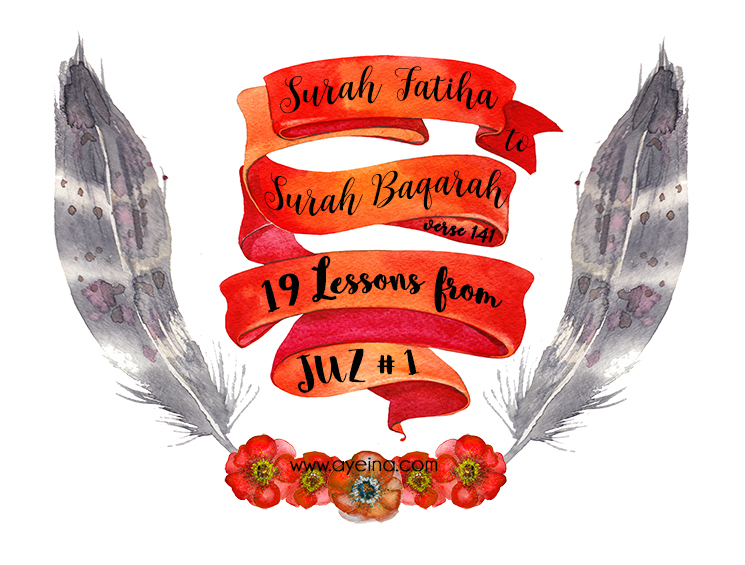 If you’ve been following our Quranic reflections series, you’d know that we are posting weekly reflections of the Qur’an, one baby step at a time. In shaa Allah, we’ll be doing a collective reflection-lesson after each completed Juz/Para. For word to word translation, here’s the PDF version of first Para of the Qur’an المٓ and here’s the collection of audio lessons. The Qur’an (first juz) starts with a dua – a refuge from being in a category of الضَّالِّينَ (those who are lost and astray) or maghdoobi alaeehim الْمَغْضُوبِ عَلَيْهِمْ (those who have evoked Allaah’s anger – which is even worse) but rather seeking to join the ranks of أَنْعَمْتَ عَلَيْهِمْ (those upon whom Allah bestowed favor – an’amta alaeehim). Those who were blessed by Allaah because of their knowledge of deen and application of that knowledge in life. I long to see and reside in the abode that You created for us with all the love. I long for Your single glimpse with my eyes wide open when in shaa Allaah I’ll get the chance to meet my prophet and You in Jannah. Cure is achieved in two ways: Preventive treatment (by staying away from lying, dishonesty, quarreling and breach of promises (according to a hadith mentioned in the lesson)) or Curative treatment (by repenting and making dua). By efforts of removing hypocrisy from our lifestyle and not confirming to double standards. In short, acting upon what we preach/teach – either to kids or to adults. In this lesson, we explored the story of a famous poet – Tufail bin Amr (RA) who tasted the sweetness of eemaan after opening his heart for truth and being confident of what he achieved after realizing his mistake of believing the propaganda of Quraish. It shows how we have perfect abilities to recognize the truth and benefit from the reminders. The words of Creator have been the same all along, but the effects on creation have been entirely individual. What makes some see so much beauty in what others see ugliness? I think the answer lies in our hearts. A pure heart breathes pure life. Pure words. It sees the blooming rose instead of thorns. It highlights a growing flower beside a volcano. It wants to see beauty and hence it is visible. Beauty of guidance is truly for the seeker. Allah could’ve given us brains like that of animals – who can function in the world normally too. They survive fine by eating, sleeping and playing. But we were created with a higher purpose hence higher strengths. And eventually, a higher number of tests. Previously, we saw how a change of heart can yield different results in different individuals. Same goes with the brain, soul, body, time, free will…we all have all of these but how we use it makes a huge difference. أَتَأْمُرُونَ النَّاسَ بِالْبِرِّ وَتَنْسَوْنَ أَنفُسَكُمْ – Do you order righteousness of the people and forget yourselves…? – We as parents and sometimes as elders who have more knowledge, command kids/younger siblings etc. over righteousness and yet, fail to apply it in our daily lives. “NEVER LIE” we order. “BE NICE to your little ones”. “No screen time”. “DON’T CONSUME cold drinks and junk etc.” The list of double standards stack up in no time. So ordering righteousness is not simply limited to something praying/fasting-related only. It has a wider meaning – teaching with your actions as well and not just empty words. It doesn’t work like this – Do as you like, disobey Allah, and then ask those who are closest to Him to make du’a, expecting to get all the wishes fulfilled on behalf of someone else’s good deeds. None can save you except Allah and your own good deeds simply make your path to salvation easy. We learned in this lesson how one can soften the heart – through constant remembrance of Allah, good deeds (like being merciful to the orphans and patting their heads) and staying away from talking excessively etc. 1: Sincerity (Ikhlas – for the sake of Allah). 2: Completeness (doing things complete). 3: Tastefulness (doing things in the best manner possible – the best way you can do it). 4: Correctness (doing things the right way – according to Quran and sunnah). Set a rule to make Astaghfaar your habit… Allah loves a consistent deed – be it small. When you see someone and feel that your life is not enough, find a tiny little thing to be grateful for. Find positivity amidst negativity and you will see abundance in your life. If you need to make gratitude an informed daily choice in your life, you can start by keeping a gratitude journal/Alhamdulillah journal. إِذ قالَ لَهُ رَبُّهُ أَسلِم ۖ قالَ أَسلَمتُ لِرَبِّ العالَمينَ – No commandment or trial was hard enough to weaken Ibrahim (AS)’s faith in Allah. He obeyed his Rabb without questioning or complaining, due to which he was given the title of خليل الله (Friend of Allah). “the sibghah of Allah” – Ibn ‘Abbaas said in the narration of al-Kalbi, as did Qataadah and al-Hasan: [it means] the deen (religion) of Allah, and it is only called sibghah because the effects of the religion manifestly appear on one who adheres to the religion just as the effects of the dyes manifestly appear on the clothing. What did you learn from your revision of the 1/30th part of the Qur’an? If you want to revise your Qur’an or start understanding it with tafseer with us, please subscribe to stay updated with Qur’anic Reflections. And start from HERE, if you’re new. BaarakAllahu lakum! Beautiful reminders! I love the lesson about the purpose of the brain and how our higher level of intellect brings on more reconsibility as well as tests and challenges. Masha Allah an excellent post!! Masha Allah I love the reminders about practicing what we preach and believing in the Qadr of Allah. Too many times we get caught up with life events that we accumulate info and knowledge without stopping to take a breadth and put into practice what we’ve learned. And each day, I try to remind myself that Allah is in control and everything has been predestined; yet still call Him to grant my heart desires. Masha Allah love the reminders about practicing what we preach and believing in the Qadr of Allah. And of course, my favourite has got to be the point about the similitude of the manifestation of the Deen to that of dye on clothes. Allahu Akbar. May Allah keep us firm and steadfast.